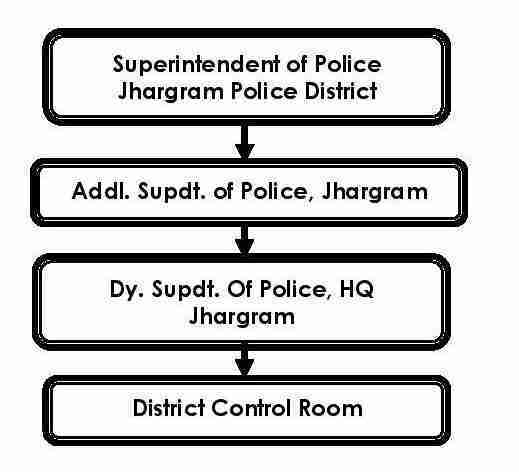 District Control Room (DCR) consisting the strength of SI/ASI-05, Constable-04, NVF-05, and HG-04. Control Room Acts 24 hours duty divided into three equals shifts. Every shift consists of equal shifts for smooth running. We delivered message to concerned District authorities after sorting the message. We collect operational program of CRPF and also collect situation report every two hours from them and record it at registered. We kept touch with PSs under Jhargram Police District about situation. We are monitoring the tour programmee of VIP and VVIP under Jhargram Police District. We also supply telephonic information to concerned authorities on receiving the same.